grandma's cookie jar: just for fun - It Is, "Make Up Your Own Holiday Day"! just for fun - It Is, "Make Up Your Own Holiday Day"! My grandson Josiah is sick today, so he and his brother Caleb are hanging out at my house. 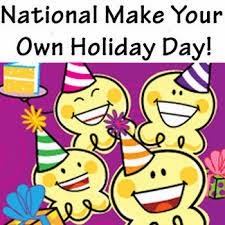 Since it is, "Make Up Your Own Holiday Day", I thought it would be especially fun on this day for us to make up our own holiday! Josiah thought we should call our "holiday"; Sharing Day and of course this special day requires a present! We decided he and Caleb could share the present; since it is, "Sharing Day"! I gave them a Mega-Blocks set with dragons and a spaceship . . . of course, this meant I needed to help them build it . . . the reason this post is so late! We are having fun on, "Sharing Day" . . . what will you name your, "holiday" on, "Make Up Your Own Holiday Day"? When will the Isabelle contest results be up? If you read the Isabelle posts, you'll see the date for the drawing - May 24, 2014 - are you over the age of 18?